WEIBER free-standing, hard wall, modular, prefabricated cleanroom system that is designed to provide superior Cleanroom performance and aesthetic appeal. Its modular, prefabricated design combines functionality with flexibility to create systems that will meet your cleanroom needs of today and into the future. These rooms are available from Class 100,000 to Class 10. The rooms are available with open free spans from 6 to 34 feet and interior room heights of 8 to 16 feet. Multiple rooms can be combined to form larger Modular Clean Room systems. The system allows for additional sections to be added to existing rooms to expand the clean room at a future date. Cleanroom has high visual appeal and is often used as a showcase cleanroom system. The large clear walls offer good visibility into and out of the room. Clear anodized aluminum panels cover the filter light area above the drop ceiling, so the exterior has a clean appearance. These Room also known as Hard Wall Clean Room and Soft Wall Clean Room. SOFT WALL are tent type clean room. They utilize full welded, reinforced, steel tubular sections. 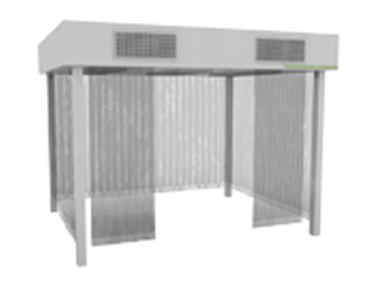 Structure is finished with an abrasion resistant oven-baked powder coat.Isostat vinyl curtains isolate the cleanroom from the ambient environment, while allowing for easy passage of materials and personnel in and out of the clean area. Vinyl curtains terminate at a specific distance above the floor to allow for exhaust of clean air out of the cleanroom. Stainless steel swivel casters feature no shedding polyurethane wheels. Soft wall panels are used for easy access to the room which means that there is no need for additional fire exits. The simplicity of the Soft wall design means that only the minimum opening is created when entering or exiting the room; this together with the self-closing nature ensure that your room integrity is maintained whilst minimizing the investment and running cost. The Soft wall strips are a highly economical solution as they are low cost and effective. Large open spans up to 34 ft. Interior clear height 8 to 16 ft.
Adjustable pressure upto 0.06 W.C. The Clean Air for the system is created by the room air cleaning device(s) that are fixed to the outside walls or the ceiling of the room. As the air enters the room all air is drawn through a HEPA filter (99.997% efficient at 0.3 microns) which creates a positive pressure in the room and therefore provides a clean area. The ceiling and wall panel are constructed of stainless steel. Clean Room air conditioning system controls humidity upto 40%. Its modular design makes installation easy and fast. Modular Softwall Cleanrooms are designed to provide clean environments from Class 100,000 to Class 10 (ISO Standards Class 3 to Class 8).